AMERICAN MANUFACTURERS RELY ON PORTS FOR IMPORTS AND EXPORTS: For every $1 billion in exports shipped through U.S. seaports, 15,000 jobs are created, according to the AAPA. The commerce secretary has oversight over agencies important to trade and ports. At confirmation hearings, Ross supported public investments in transportation. AAPA: US ports are falling behind 21st century needs. The United States Senate confirmed the billionaire investor Wilbur Ross as Secretary of Commerce last night. He is to be sworn in today. As commerce secretary, Ross will have oversight over a number of agencies important to trade and ports, including the International Trade Administration, which promotes US trade and investment, and the National Oceanic and Atmospheric Administration. NOAA’s weather service and aids to navigation divisions provide important safety and efficiency programs for mariners. 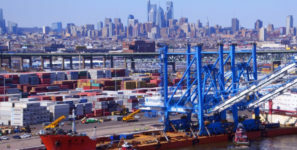 With today’s global marketplace and worldwide supply chain, American manufacturers, farmers, and businesses rely on ports more than ever to handle the raw materials and semi-finished components needed for production here in the U.S., and to be able to export their products and enhance their international competitiveness. For every $1 billion in exports shipped through U.S. seaports, 15,000 jobs are created.